The beginning was made in the form of ‘land rent’ and ‘transit charges’, and in 1762, it was consolidated into duty. The salt tax/duties on the annual requirement of a family amounted at one time up to nearly two months’ wages of a labourer. All these culminated in Gandhiji selecting Satyagraha against salt taxes as the key issue in 1930 while leading the civil disobedience movement for India’s freedom from the British colonial rule. Raj Kumar Shukla was born on 23rd August 1875 in Satwaria village of Champaran in Bihar. He a famous Indigo cultivator of Champaran and he was a money lender as well. He rose to fame for his close association with Gandhiji during the Champaran Satyagraha. Raj Kumar Shukla convinced Mahatma Gandhi to visit Champaran, which was a turning point in India’s struggle for independence. Subhash Chandra Bose on December 30, 1943 had hoisted Tricolour for first time on free Indian soil at Cellular Jail of Port Blair during his visit to Andaman and declaring the island as the free territory from the British rule. On same occasion, he had announced freedom of Andaman & Nicobar Islands (making it first Indian Territory) from the British rule and renamed them as “Shaheed-dweep” (Martyr Island) and “Swaraj-dweep” (Self-rule Island). The island at that time was liberated from British rule by Japan which captured it during World War – II. Why in news? Union Ministry of Finance has announced to release Rs 75 commemorative coin on occasion of 75th anniversary of hoisting of Tricolour for first time by Netaji Subhash Chandra Bose at Cellular Jail, Port Blair. Born on 11 November 1888 and died on 22 February 1958. He was senior Muslim leader of Indian National Congress during Indian independence movement. He is commonly remembered as Maulana Azad (word Maulana is honorific meaning ‘Our Master’) and he had adopted Azad (Free) as his pen name. He was first Minister of Education of Independent India. He had played important role in foundation of Jamia Millia Islamia at Aligarh in Uttar Pradesh. During his young age, he rose to prominence through his work as journalist, publishing works critical of British Raj and espousing causes of Indian nationalism. He became leader of Khilafat Movement, during which he came into close contact with Mahatma Gandhi. He later became enthusiastic supporter of Gandhi’s ideas of non-violent civil disobedience and worked to organise the non-co-operation movement in protest of the 1919 Rowlatt Act. He was committed to Gandhi’s ideals, including promoting Swadeshi (indigenous) products and cause of Swaraj (Self-rule) for India. In 1923, at age of 35, he became youngest person to serve as President of Indian National Congress. 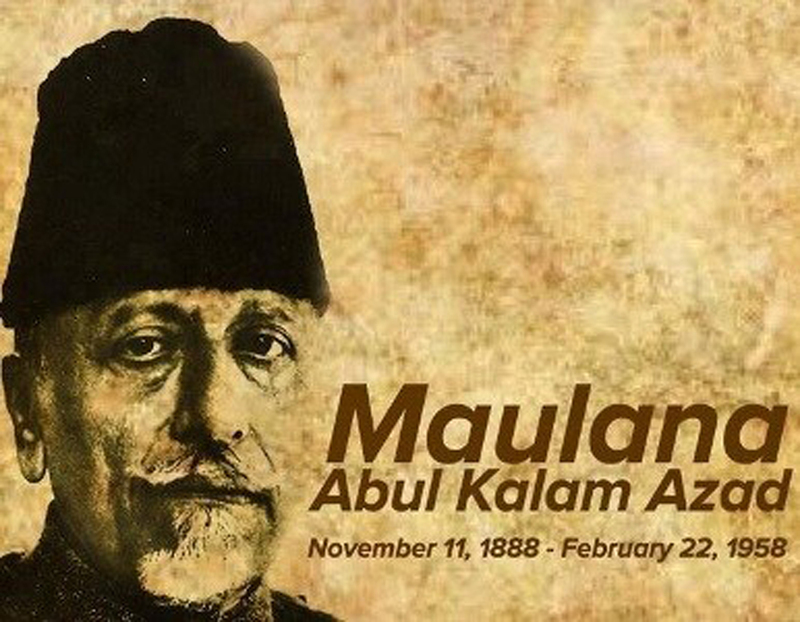 Why in news?National Education Day of India is celebrated every year on 11 November to commemorate the birth anniversary of Maulana Abul Kalam Azad, the first education minister of independent India. He was freedom fighter and tribal leader, born in 1809 in small town Khinda in Sambalpur (now in Odisha). He was direct descendant from Madhukar Sai and was legally entitled to be crowned as king of Sambalpur after demise of king Maharaja Sai in 1827. But he was not acceptable to British power and ignored his claim for succession. He revolted against British raj for throne after it allow widow of Madhukar Sai Rani Mohan Kumari to succeed him and then followed by succession of Narayan Singh, a descendant of royal family but born of low caste as king of Sambalpur. His revolution against the British commenced from 1827 when he was only 18 years of age and continued till 1862 when he surrendered and even after that, until he was finally arrested in 1864 – a total period of 37 years. He had suffered imprisonment in Hazaribagh Jail for 17 years in course of his revolutionary career and after his final arrest for another term of 20 years including his detention of 19 years in remote Asirgarh hill fort till he breathed his last there. He was not only great revolutionary throughout his life but also inspiring leader of the people. He had espoused cause of the down trodden tribal people who were being exploited by higher castes people and who became tools in hands of the British for establishment of their political power in Sambalpur. He died in Asirgarh Jail on 23 May 1884. Azad Hind Government was founded in Singapore on October 21, 1943. It was India’s first independent government established by Indian nationalists-in-exile during latter part of WWII in Singapore with monetary, military and political assistance from Imperial Japan. It was a part of political freedom movement originating in 1940s outside India with purpose of allying with Axis powers during Second World War (WWII) to free India from British Rule. It was inspired by ideas of Netaji Subhash Chandra Bose, who was leader of Azad Hind Government and also Head of State of this Government-in-exile. This government was recognized by the countries such as Germany, Japan, Philippines, Korea, China, Italy and Ireland. Japan provided the Andaman and Nicobar islands to this temporary government, later these islands were renamed Shaheed Island (Andaman) and Swaraj Island (Nicobar). It was also having its armed force Azad Hind Fauj or the Indian National Army (INA), whose purpose was to free India from British control. Subhash Chandra Bose was the supreme commander of this army. Ras Bihari Bose had played important role in its establishment. This force had played crucial role in bequeathing a much needed impetus to India’s struggle for Independence. It had proclaimed authority over Indian civilian and military personnel in Southeast Asian British colonial territory and prospective authority over Indian territory to fall to Japanese forces and INA during Japanese thrust towards India during WWII. This government had its own currency, court and civil code. Netaji Subhash Chandra Bose gave a famous slogan Delhi Chalo (Come to Delhi) after formation of this government. Quit India Movement (Bharat Chhodo Andolan or August Movement or August Kranti) was an important milestone in the Indian freedom struggle. 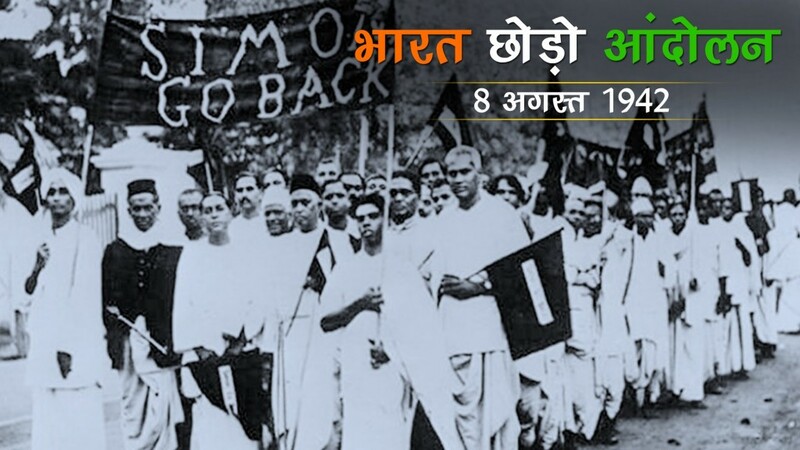 It was civil disobedience movement launched at Bombay session of the All-India Congress Committee (AICC) by Mahatma Gandhi on 8 August 1942 demanding an end to British Rule of India. 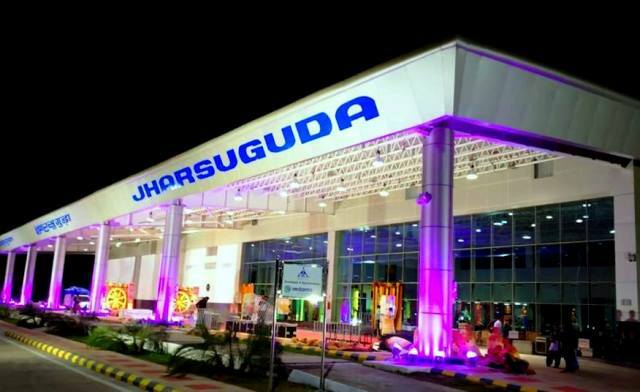 It was launched after Mahatma Gandhi had made a call to Do or Die in his Quit India speech delivered in Bombay at the Gowalia Tank Maidan on 7 August 1942. The movement called for India’s immediate independence and aimed to force British Government to negotiating table by holding Allied war effort hostage. By launching this movement, Gandhiji hoped to bring British government to negotiating table as Cripps Mission had failed and give strong footing against sending Indians to fight on behalf of Britain in World War II. Quit India Resolution drafted by Jawaharlal Nehru and was moved by him on 8th August 1942 in AICCC session and Sardar Patel seconded it. Under the leadership of Mahatma Gandhi, people across India came together to uproot imperialism. The 28,000-strong Marathas, led by Peshwa Baji Rao II intended to attack Pune. On their way, they were met by an 800-strong Company force that was on its way to reinforce the British troops in Pune. 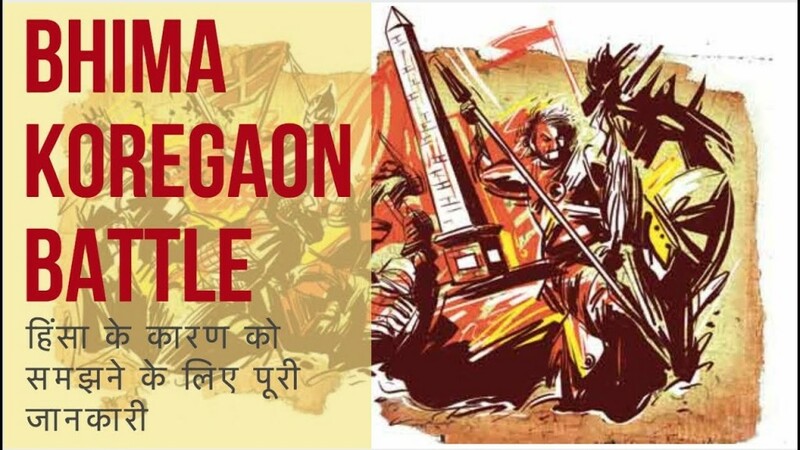 The Peshwa dispatched around 2,000 soldiers to attack the Company force stationed in Koregaon. Led by Captain Francis Staunton, the Company troops defended their position for nearly 12 hours. The Company troops of Indian origin included predominantly Mahar Dalit soldiers belonging to the Bombay Native Infantry, and therefore Dalit activists regard the battle as a heroic episode in Dalit history. The Koregaon pillar inscription features the names of the 49 Company soldiers killed in the battle. 22 of these names end with the suffix -nac (or -nak), which was used exclusively by the people of Mahar caste. The obelisk was featured on the Mahar Regiment’s crest until Indian Independence. While it was built by the British as a symbol of their own power, today it serves as a memorial of the Mahars. Although it is currently portrayed as victory of lower caste over upper caste Peshwas, the Mahars had fought for the Peshwa rulers. Recent rallies in Maharashtra by Dalit leaders. Paiks were the traditional landed militia of Odisha, used to perform policing functions. They owned rent-free land that was given to them for their military service to Kingdom of Khurda. However they were rendered landless by the policies of British East India Company. The revolution was in response to the tinkering of the revenue system by the British in 1803. In response, the farming community of Odisha rose in rebellion. The landed militia of Khurda was called Paiks. Paika Rebellion of 1817 has various social, economic and political reasons. 200 years completed in 2017. PM Modi announced setting up of a Chair on the Paika Rebellion, in Utkal University, Bhubaneswar.